You can specifiy the colors used to Husband & Wife, Children, and Parents. If you check this box, you can then select the colors. You many specify them by RGB code, or select from the default windows choices. Use Custom background allows you to specifiy the background JPG or GIF image that will be used for all images. When you check this box, you will be able to press the 'Custom Background' button and specify the path to the image. This image will be copied into the output directly with all the other files. Use Default Background allows you to use the faded pedigree chart background image that I use on my website. I like it, I thought you might also. If you don't check either of these boxes, no background image will be used. The Owner Info dialog is where you enter in your contact information. You can leave any and all of these fields blank. But if you don't put in your name and email address, people (probably your cousins) interested in sharing information with you will not know how to contact you. If you check the 'Include Copyright on pages' box, the name you put in the 'Your Name' field will be put on the bottom of each page with 'copyright' next to it. Many people asked for the ability to include links to pages that they create, or other websites. I added the Custom Links section for this reason. If you press the Edit Custom Links button, you will see a dialog that allows you to specify the webpage address for as many links as you like. These links will be placed near the bottom of the main page (index.htm). If you are creating pages in more than one language, you must add the links for the different languages separatly. Click on this link to get more details about the Edit Custom Links dialog. For each of the 4 categories of pages (Family, Descendancy, Pedigree, and Notes), GED4WEB creates index pages with the names of all the individuals on these pages. One page is created for each letter of the alphabet. When these pages are created you have the option to include birth & death dates (if known), as well as Male or Female (if known). As with all pages, if you have selected to suppress dates for living individuals, they will also be suppressed on the index pages. This is one of my favorite features. This allows you to mark all your ancestors with a red dot , allowing anyone viewing your pages to know if a name they found on your pages is a direct ancestor or just a relative of an ancestor. When I get an email from someone identifying a person they found on my webpage (who they are related to) I look for a red dot to see quickly if this person is one of my ancestors also. I find this a great time saving feature. 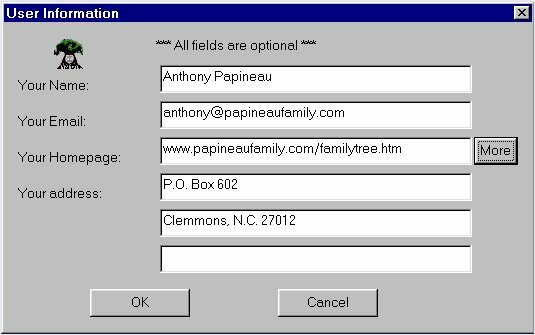 If you want to mark all ancestors of a particular person (I use my son, so I also get my wife's ancestors), you check this box and press the Select Individual' button. You then enter their GEDCOM Id into the Identify All Ancestors Of This Individual dialog. 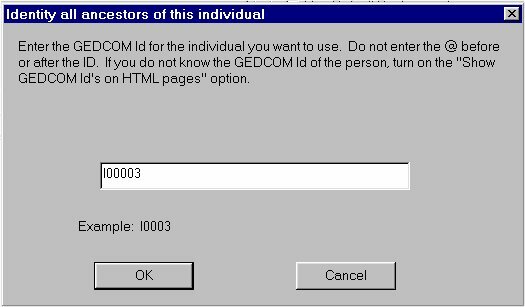 If you don't know their GEDCOM Id, check the Show GEDCOM Id's on HTML pages box, and create the pages one time. 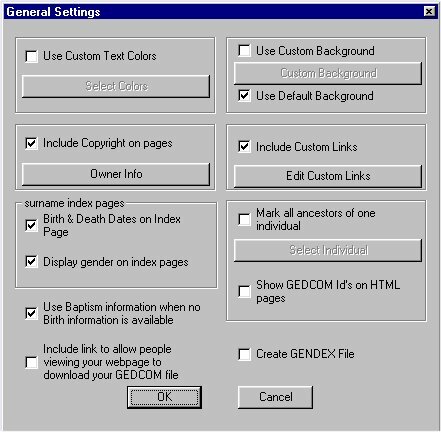 Then, once you find out their GEDCOM Id, you can uncheck the box and fill in the GEDCOM Id in the above dialog box. This is case sensitive, so don't confuse your 'I' with a lower case 'L'. The above example is an 'I'. This option allows you to tell GED4WEB that, if there is not birth information for an individual, and there is baptism information, display the baptism informaiton where birth information us normally diaplayed. If this option is checked, burial information will also be used when no death information is available.